June 21, 2015 – They arrived relatively quickly, despite the weather , to Genet Basin Camp3 at 4389m altitude – 14200feet with all equipment.They tried to get some well deserved rest by the end of the day especially since they confronted there with some contradictory weather forecasts. They had to call back home to get the weather forecast for the fallowing days with the help of alpinist Cosmin Andron. Thank you ! They will have to make a change of plan due to weather. 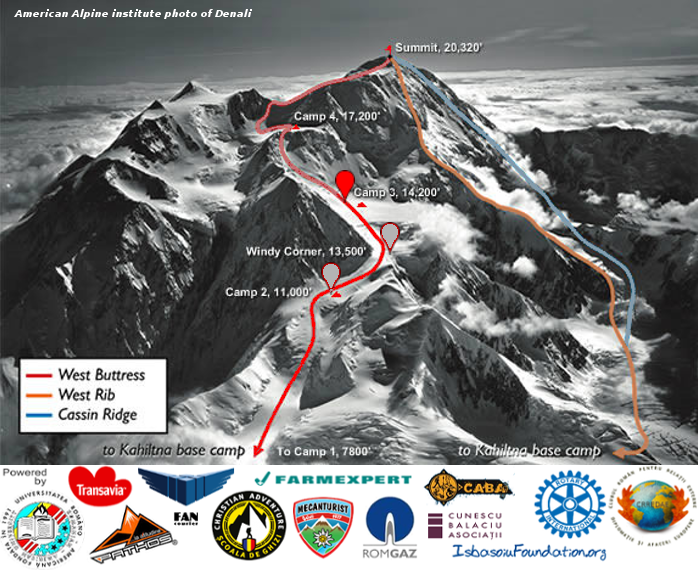 They will try today June 22, 2015 to climb to Camp 4 – (High Camp ) also known as “The Crow’s Nest” at 5242m altitude – 17.200feet . Initial plan was to stay at Camp4 three days for Camp4 but now they will be able to stay only 1 day for acclimatization Tuesday 23 June 2015. On June 24, 2015 , Wednesday , they will try to reach the summit. It seems is one of the last days when the weather allows it. It is snowing heavily now but the wind is at acceptable intensity. Near the end of the week temperatures begin to decline drastically and the wind will intensify making an ascent to summit imposible.